Our Turquoise Table is a Sweet Resting Spot in Bellaire, Texas! If you’ve stopped by our Bellaire, Texas, store in recent weeks, you might have noticed a new addition out front. Situated on our lawn, facing Bellaire Boulevard, is a bright turquoise table. What’s it all about? Oh, you know we’re glad to fill you in. We’ll be the first to admit that the turquoise table was not an original idea on our part. A woman named Kristin Schell was the one who dreamed it up, originally as a way to bring her neighbors together. As she explains on her website, she painted a table, placed it in her front yard and immediately saw life on her residential street change for the better. That simple gesture welcomed people to her property. It gave them a place to sit, relax and visit with people they might not have had the opportunity to talk with before. It actually started a national movement, which you can follow by searching hashtags #theturquoisetable and #frontyardpeople on social media. And since Magpies is all about community, we loved the idea! We began our project with a picnic table from Lowe’s and a gallon of turquoise paint. In a couple of hours, we had a happy, eye-catching table that we couldn’t wait to display. 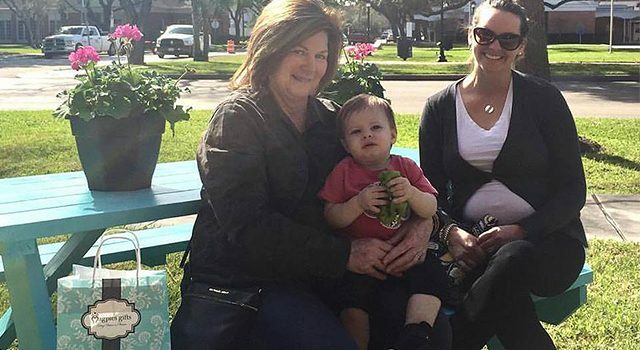 Shortly after our new table went up, we were delighted to find a sweet mother, daughter and grandbaby using it for a morning visit while they waited on our shop to open. And they haven’t been the only ones who have taken advantage of the space. It warms our hearts anytime we see someone seated out there — whether it’s a husband sipping coffee while the ladies browse, shoppers taking a breather before they head to their next destination or simply passersby looking for a place to rest their feet. As they say, bloom where God plants you. And God has planted us in Bellaire. When we open our doors at Magpies, we aren’t just giving people a place to spend a little money. We want to welcome the community in and make ourselves available to friends and customers in whatever way possible. Our turquoise table is just another way to make that happen. Join the movement to bloom where you are planted, to love your neighbors, and begin a front yard revival right here in Bellaire, Texas.